This article is about the colonial governor of Massachusetts. 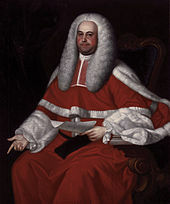 For his son, the chief justice and lieutenant governor of Nova Scotia, see Jonathan Belcher (jurist). Jonathan Belcher (8 January 1681/2  – 31 August 1757) was a merchant, businessman, and politician from the Province of Massachusetts Bay during the American colonial period. Belcher served simultaneously for over a decade as colonial governor of the British colonies of New Hampshire (1729–41) and Massachusetts (1730–41) and later for ten years as governor of New Jersey (1747–57). Born into a wealthy Massachusetts merchant family, Belcher attended Harvard College and then entered into the family business and local politics. He was instrumental in promoting Samuel Shute as governor of Massachusetts in 1715, and sat on the colony's council, but became disenchanted with Shute over time and eventually joined the populist faction of Elisha Cooke, Jr. After the sudden death of Governor William Burnet in 1729 Belcher successfully acquired the governorships of Massachusetts and New Hampshire. During his tenure, Belcher politically marginalized those who he perceived as opposition and made many powerful enemies in both provinces. In a long-running border dispute between Massachusetts and New Hampshire, Belcher sided with Massachusetts interests despite openly proclaiming neutrality in the matter. It was later discovered that he allowed illegal logging on Crown lands by political allies. His opponents, led by William Shirley and Samuel Waldo, eventually convinced the Board of Trade to replace Belcher (with Shirley in Massachusetts and Benning Wentworth in New Hampshire), and the border dispute was resolved in New Hampshire's favor. Belcher was appointed governor of New Jersey in 1747 with support from its Quaker community. He unsuccessfully attempted to mediate the partisan conflicts between New Jersey's Quakers and large landowners, and promoted the establishment of the College of New Jersey, now Princeton University. Through most of his tenure as royal governor, Belcher was ill with a progressive nervous disorder, and died in office in 1757. Belchertown, Massachusetts is named for him. Belcher's summer home in Milton, Massachusetts was destroyed by fire in 1776, but portions of it may have survived in its replacement, built by his widow. Despite being treated with indifference by Belcher, William Shirley obtained political prominence and power, later maneuvering to obtain Belcher's removal from office in 1741. Richard Waldron was Belcher's kinsman and right-hand man in the administration of the New Hampshire province. Samuel Waldo, a wealthy Massachusetts businessman with considerable interests in logging, objected to the practice of illegal logging on Crown lands permitted by Belcher during his tenure as governor. Belcher became influenced by the theology and preaching of several evangelical clergymen, including George Whitefield (pictured here), who were affiliated with the Great Awakening. Listed on the National Register of Historic Places, the Belcher-Ogden House in Elizabeth, New Jersey, was the residence of the governor in the former provincial capital, then called Elizabethtown. One controversial matter that Belcher was able to finesse was the establishment of the College of New Jersey (now known as Princeton University). The college was proposed by New Jersey's evangelical Presbyterians, with whom Belcher found religious agreement. However, Quaker leaders and the proprietors had expressed great reservations about the Presbyterians' drive to gain a charter for the school (on the grounds that it would be used as a vehicle for converting their children), and Governor Morris had refused to grant one. After his death, council president John Hamilton, acting prior to Belcher's appointment, granted the charter. The college's opponents pressured Belcher to withdraw the charter; he instead adopted the college as a cause to support, and expanded its board to include a diversity of religious views. When its first building was constructed in 1754, the college's board wanted to name it after Belcher, but he demurred, preferring it to be named in honor of King William, who hailed from the Dutch House of Orange-Nassau. As a result, the building (which still stands) is known as Nassau Hall. He also supported the establishment of the college's library, to which he bequeathed his personal library. In 1748, Belcher issued a second Charter to the College of New Jersey, since the validity of the initial charter, which was granted in 1746 by Acting Governor Jonathan Dickinson, came under question. Gov. Jonathan Belcher's grave is near the Dana family plot in the Old Burying Ground, Cambridge, Ma. ^ a b In the Julian calendar, then in use in England, the year began on 25 March. To avoid confusion with dates in the Gregorian calendar, then in use in other parts of Europe, dates between January and March were often written with both years. Dates in this article before 1752 are in the Julian calendar unless otherwise noted. ^ Richard H. Saunders; Ellen Gross Miles; National Portrait Gallery (Smithsonian Institution) (1987). American colonial portraits, 1700–1776. Published by the Smithsonian Institution Press for the National Portrait Gallery. ISBN 978-0-87474-695-2. ^ Foster, p. 180, documents at least seven scholarly approaches to the subject, including Batinski and Zemsky referenced here. ^ Samuel, Drake (1871). Historic Fields and Mansions of Middlesex. J.R. Osgood and Company. p. 279. ^ An Historic Guide to Cambridge. Cambridge (Mass.). 1907. ^ "Find Tomb Believed Jonathan Belcher's". Google News. Allegro, James (March 2002). ""Increasing and Strengthening the Country": Law, Politics, and the Antislavery Movement in Early-Eighteenth-Century Massachusetts Bay". The New England Quarterly. 75 (1). JSTOR 1559879. Barry, Joseph (1855). History of Massachusetts, Volume 2. Boston: Philips and Sampson. OCLC 19089435. Batinski, Michael (1996). Jonathan Belcher, Colonial Governor. Lexington, KY: University Press of Kentucky. ISBN 978-0-8131-1946-5. OCLC 243843478. Bishop, John; Freedley, Edwin; Young, Edward (1864). A History of American Manufactures. Philadelphia: Edward Young and Co. OCLC 2171081. Buggey, S. (1979). "Belcher, Jonathan". In Halpenny, Francess G (ed.). Dictionary of Canadian Biography. IV (1771–1800) (online ed.). University of Toronto Press. "Cultural Inventory Record for Belcher-Rowe House". Commonwealth of Massachusetts. Retrieved 16 January 2013. "Cultural Inventory Record for Jonathan Belcher House". Commonwealth of Massachusetts. Retrieved 16 January 2013. Currier, John James (1895). Ould Newbury: Historical and Biographical Sketches. Boston: Damrell and Upham. OCLC 2482841. Daniell, Jere (1981). Colonial New Hampshire: A History. Millwood, NY: KTO Press. ISBN 978-0-527-18715-6. OCLC 470895446. Fenety, George (1896). Life and Times of the Hon. Joseph Howe. Saint John, NB: E. S. Carter. OCLC 5738697. Fisher, Edgar (1911). New Jersey as a Royal Province, 1738 to 1776, Volume 41. New York: Longmans, Green. OCLC 153851323. Foster, Stephen (June 2004). "Another Legend of the Province House: Jonathan Belcher, William Shirley, and the Misconstruction of the Imperial Relationship". The New England Quarterly (Volume 77, No. 2). JSTOR 1559744. Gannett, Henry (1905). The Origin of Certain Place Names in the United States. Washington, DC: Government Printing Office. OCLC 1156805. Gillespie, Charles; Curtis, George (1906). An Historic Record and Pictorial Description of the Town of Meriden, Connecticut. Meriden, CT: Journal Publishing Co. OCLC 35898838. Hatfield, Edwin Francis (1868). History of Elizabeth, New Jersey: Including the Early History of Union County. New York: Carleton and Lanahan. OCLC 123118175. Hinman, Royal Ralph (1852). A Catalogue of the Names of the Early Puritan Settlers of the Colony of Connecticut. Hartford, CT: Case, Tiffany. OCLC 10981579. Hyde, William (1847). An Address, Delivered at the Opening of the new Townhall, Ware, Mass., March 31, 1847: Containing Sketches of the Early History of that Town, and its First Settlers. Brookfield, MA: Merriam and Cook. OCLC 11888596. Kimball, Everett (1911). The Public Life of Joseph Dudley. New York: Longmans, Green. OCLC 1876620. Maclean, John (2006) . History of the College of New Jersey, at Princeton, Volume 1. Lulu. ISBN 978-1-4303-0196-7. OCLC 122372315. "The Mission House". The Trustees of Reservations. Retrieved 11 February 2013. "Old New-Gate Prison and Copper Mine". State of Connecticut. Retrieved 19 February 2013. "NRHP nomination for Belcher-Ogden Mansion-Price, Benjamin-Price-Brittan Houses District". National Park Service. Retrieved 16 January 2013. Pencak, William (1981). War, Politics and Revolution in Provincial Massachusetts. Boston: Northeastern University Press. ISBN 978-0-930350-10-9. OCLC 7178895. Peterson, Mark (2002). The Selling of Joseph: Bostonians, Antislavery, and the Protestant International, 1689–1733. Massachusetts Historical Review. JSTOR 25081169. Peterson, Mark (2009). Bailyn, Bernard (ed.). "Theopolis Americana: The City-State of Boston, The Republic of Letters, and the Protestant International, 1689–1739". Soundings in Atlantic History. Cambridge, MA: Harvard University Press. ISBN 978-0-674-03276-7. OCLC 261174525. Phelps, Richard (1860). A History of Newgate of Connecticut, at Simsbury, now East Granby. Albany, NY: J. Munsell. OCLC 1114495. Princeton University Catalog. Princeton, NJ: Princeton University. 1922. OCLC 5542866. Proceedings of the Massachusetts Historical Society, Volume 16. Boston: self-published. 1903. OCLC 1695300. Shipton, Clifton (1995). New England Life in the Eighteenth Century. Cambridge, MA: Belknap Press. ISBN 978-0-674-61251-8. OCLC 34050414. Schutz, John (1961). William Shirley, King's Governor of Massachusetts. Chapel Hill, NC: University of North Carolina Press. ISBN 978-0-8078-0830-6. OCLC 423647. Stark, James (1907). The Loyalists of Massachusetts. Boston: J. H. Stark. OCLC 1655711. Wood, George Arthur (1920). William Shirley, Governor of Massachusetts, 1741–1756, a History. New York: Columbia University. Zemsky, Robert (1971). Merchants, Farmers, and River Gods. Boston: Gambit. OCLC 138981.